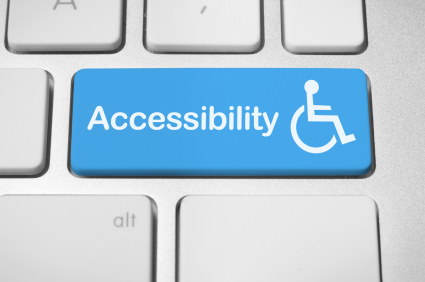 "Accessible" means a person with a disability is afforded the opportunity to acquire the same information, engage in the same interactions, and enjoy the same services as a person without a disability in an equally effective and equally integrated manner, with substantially equivalent ease of use. The person with a disability must be able to obtain the information as fully, equally and independently as a person without a disability. Although this might not result in identical ease of use compared to that of persons without disabilities, it still must ensure equal opportunity to the educational benefits and opportunities afforded by the technology and equal treatment in the use of such technology. As an instructor, you are required to make the online content in your classes accessible to all students. Below are tips and guidelines to make your course ADA Compliant. Maintain a proper reading order in tables. Don't use color alone to convey meaning. Eliminate blinking / flashing content. Don't require inaccessible software applications be used. Whenever you record audio or video, materials that are solely visual, should be described verbally to be accessible to someone who is blind. If PowerPoint or other files are shown in a video, make the actual ppt or pptx files (source files) available to students for review. YouTube is a keyboard accessible player. In addition, it can optimize the video streaming to the user's best settings. If you are using a different video player, please test it to make sure it can be used by those who cannot use a mouse. Keyboard commands clearly provided may also be used. Could you complete the course without using a mouse? Camtasia is a computer screen capturing software used to create video tutorials of an on screen action. With Camtasia Studio, instructors can record narrated PowerPoint presentations and post them as online lectures or learning supplements for their students. Add media & interactive hot spots to enhance your lecture. Camtasia is available to ICCOC online instructors. It is available for Mac and Windows, but only the Windows version has voice recognition. With Camtasia you can record, caption and produce your media. You can record from a webcam directly into YouTube or upload a video. Login to your YouTube account. It is best if you use Camtasia (see above) to record audio narration of a PowerPoint (ease of captioning, will play on multiple platforms, doesn't require proprietary software to play), however, you can create a PowerPoint with audio narration. Use the Sub-titling text add-in for Microsoft PowerPoint 2010. Make sure your PowerPoint, the audio narration and the sub-titles/captions play on Windows and Mac computers. Confirm that all of your students have the software required to play the PowerPoint with the narration and sub-titles. Click on the 'how it works' tab, and follow the instructions. Please Note: This tool is no longer free, but it only costs $20 a year and it's well worth the cost!